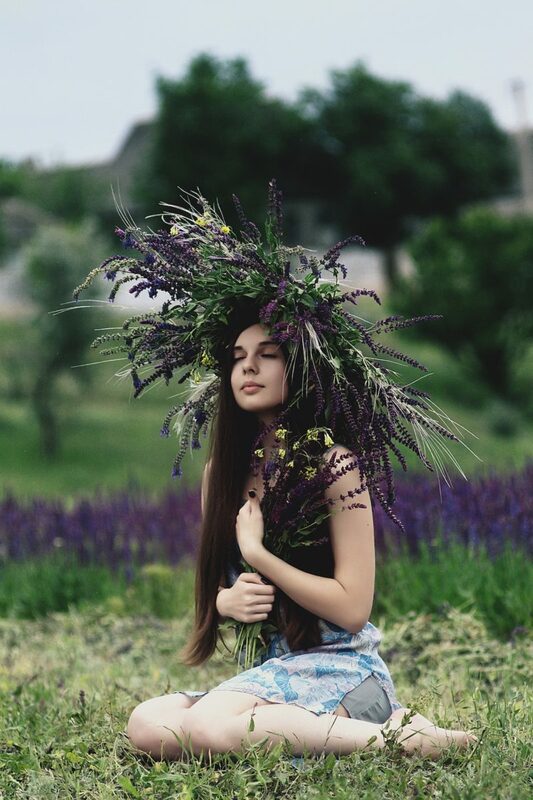 Lavender evokes a million emotions. It is not just the senses of sight, smell, touch, and taste. 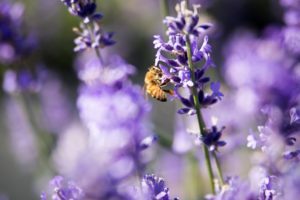 Once you have experienced a warm day, the scent of blooming lavender floating on a soft breeze, and the gentle buzzzz of bees in their gathering, there is no forgetting its intimacy–the way it touches something at your very core. 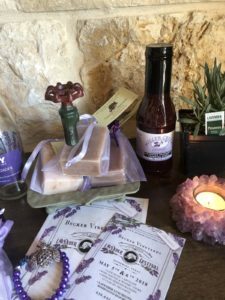 It is with that in mind that I headed over to the Lavender Festival at Becker Vineyards last Sunday. Arriving 20 minutes before opening, I was already late and my parking spot skimmed the far edge. 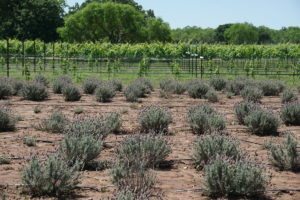 What we won’t do for wine, food, and lavender? Friday had been stormy–high winds, inches of rain, thunder and lightning, and power outages. By Saturday, the skies were crystal blue. Sunday dawned beautiful, but the ground was still soft and pliable. How soft and pliable I found out almost immediately upon setting foot within the grounds, but the tents and tables were enough of a distraction. I picked up my foot from the soft ground and carried on. There were tables and tents of jewelry, bird paraphernalia, clothing, pottery, art work, and lavender products. Lots of lavender. And lavender plants mixed with succulents. 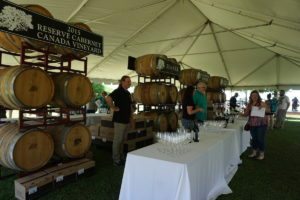 Becker Vineyards had a stunning display of their wines and multiple tasting venues. People strolled in and out of the shops and music played a soft backdrop. There was a certain enchantment to the day. The food, cheese plates and flatbreads, looked wonderful. However, Clear River Ice Cream and Bakery had their own food truck. Tough luck for me. 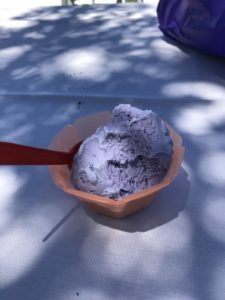 Besides their wonderful sandwiches and several flavors of ice cream, they were serving lavender ice cream and chocolate lavender ice cream. There was no holding back! Clear River is one of my favorite places in Fredericksburg. I did not stay for the cooking demonstrations, but I could tell they were going to be a popular event. And the Reidel Tasting was begging for my attendance. No! It was time to head back to my writing. Home, I became lost in the beauty of the day. I had lavender on my mind. May is such a stunning time of year in Texas Hill Country. It’s not just the lavender or the way the sun sets on yet another gentle day. It’s the way the place tugs on your heart. The wildflowers are in full bloom–Mexican Hats, Indian Blankets, Cedar Sage, Indian Paintbrush, and Winecups are just some of the enchanting flowers found growing in culverts, fields, and gardens. This is the time of year for a profusion of color. The peaches are readying for harvest. 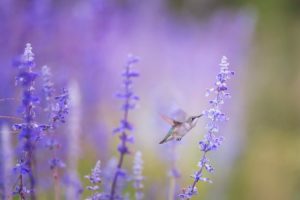 The hummingbirds and butterflies are gathering around nectar. And the heady days of summer are around the corner. It is this beauty that presents me with the conundrum I have been facing a lot these days. How does one square the beauty of the world and the peace of a moment with the realities conveyed within some of my own writing. 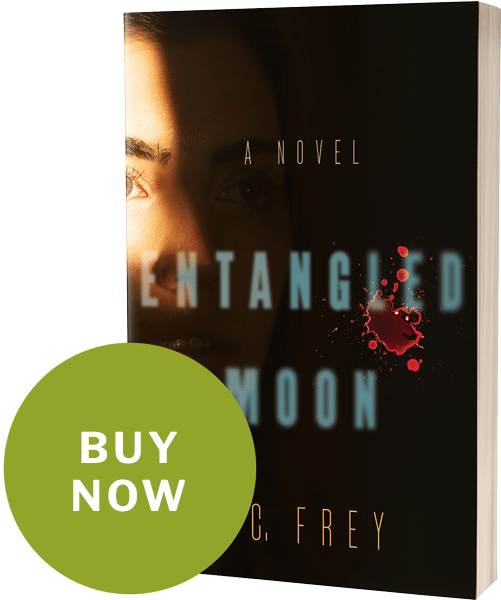 As a writer of corporate suspense thrillers, I deal with some rather unsavory characters who, unfortunately, are not always that far off from real life people. But then lavender gives me the answer. We cannot prevent others from making the choices they make, but we can stand for what we believe is true and correct. We can stand in awe of the beauty around us. 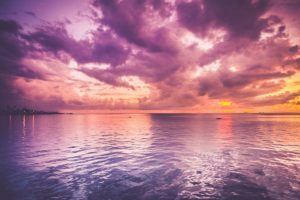 We can allow the healing purple of lavender to ease suffering. We can embrace the enchantment of the moment. We can do all these things and more….